GEORGETOWN, Ky. – Bodies strewn all over the landscape. The crumpled remains of a car and a tractor. First responders working feverishly to treat the injured as a helicopter touches down. Fortunately, this was a dramatization put on by Scott County FFA with help from the Kentucky Department of Agriculture and local emergency personnel. The mock accident during Friday’s “Pep Rally for Life” at Brooking Park was designed to show students how one moment’s inattention behind the wheel can lead to tragedy. 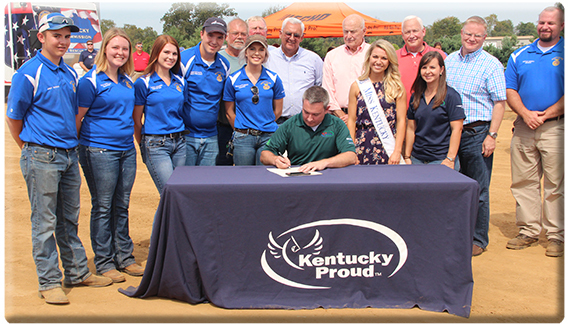 Commissioner Quarles signed a proclamation declaring Sept. 18-24 Farm Safety and Health Week in Kentucky to promote safety on the farm. In the fall, that message extends to Kentucky roadways, where motorists often encounter farm machinery moving from one field to another during the harvest season. In the scenario that played out at the “Pep Rally for Life,” a student was driving while intoxicated and texting when the vehicle the student was driving collided head-on with a tractor. The mock accident resulted in arrests, critical injuries, and even fatalities. A second “Pep Rally for Life” is scheduled Tuesday in Garrard County. The KDA’s Farm & Home Safety Program reaches some 1.5 million people a year at schools, civic clubs, and major events such as the National Farm Machinery Show and the Kentucky State Fair. The program utilizes a rollover tractor simulator, which demonstrates the correct use of a rollover protective structure (ROPS) and seat belt to protect a tractor operator if the tractor turns over; a miniature grain bin and wagon, which illustrate the danger of being trapped by grain; and ATV, anhydrous ammonia tank, and PTO displays. Dale Dobson of LaRue County, the KDA’s Farm and Home Safety Program administrator, started the program and brought it to the department in 1998. Kentucky deaths in agriculture, forestry, fishing, and hunting totaled 13 in 2015, according to the Kentucky Injury Prevention and Research Center.